* This is my article in BusinessWorld on April 11, 2017. The sharing economy is among the wonderful new inventions as humanity innovates with more modern technology. Technology companies (not transport firms or hotels) now allow private motorists to transport passengers and private homeowners can take guests and visitors for a fee via Airbnb. There are two major advantages of tech companies in land transportation like Uber, Grab, and Lyft. First, transparency between the driver and passenger/s. Since both drivers and passengers have accounts with these tech companies officially called transportation network vehicle services (TNVS), they can identify each other -- using car model and plate number details -- even before the trip begins. As a result, problems like hold-ups and sexual attacks are minimized under this scheme. Second, passenger convenience. Passengers need not bring a car and brave the traffic, look for parking later, and privately owned cars are generally cleaner than taxi and drivers tend to be friendlier than the average taxi drivers. There is an interesting study comparing Uber, Grab and conventional taxis done last year by UP Civil Engineering graduate students and professor. The authors got 18 respondents for a travel diary survey and take trips for 30 days. Then they also conducted an availability survey to measure the number of available vehicles of Uber, Grab, and Taxi at a specified time and location. The study has six tables, I summarized the results for Tables 2, 3 and 6 below. 1. 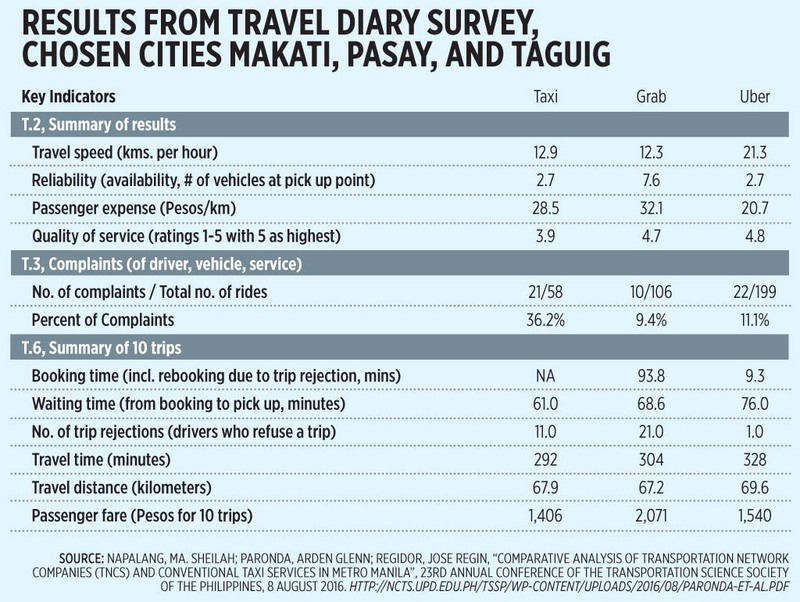 Conventional taxis have (a) lowest ratings by passengers, (b) highest percentage of complaints, more than 3x that of complaints with Grab and Uber, (c) 2nd to Grab in trip rejections, and (d) lowest cost for 10 trips, though the difference is not high compared with Uber. 2. 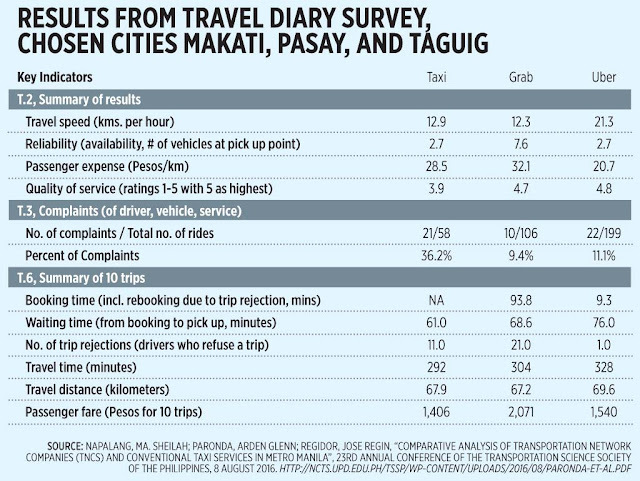 Grab cars have (a) highest reliability and availability of vehicles, (b) highest cost per kilometer, (c) lowest % of complaints but small difference with Uber, (d) longest booking time, mainly due to (e) highest trip rejections, 2x that of conventional taxis and 21x that of Uber. 3. Uber has (a) fastest travel speed, (b) lowest passenger cost per kilometer, (c) highest passenger ratings though small difference with Grab, (d) lowest booking time but also (e) longest waiting time before being picked up, and (f) lowest trip rejection, almost zero. There seems to have some inconsistency in the Uber data: it has the fastest travel speed in kph yet it has the longest travel time to cover a slightly longer distance than those covered by taxis and Grab. Nonetheless, it is a good study, congratulations to the three authors. Now the problem is with the government regulator, the Land Transportation Franchising and Regulatory Board (LTFRB). Since July 2016, it has stopped accepting applications for TNVS. As a result, recent cars that have registered with Grab and Uber since that temporary ban may be subject to state harassment. The LTFRB imposes multiple bureaucratic requirements that involve around 16 to 21 permits from various government agencies. These include tax clearance from the BIR, business permit from DTI and LGUs, among others. The usual requirements by Uber and other ride-sharing companies for their partner drivers are only four: having their own vehicle, a driver’s license, a background check, and insurance coverage for passengers. One result of these multiple bureaucracies is fewer supply of TNCs drivers and cars compared to the big and rising passenger demand. Until end-2016, there were only around 7,000 Uber drivers in Metro Manila vs. some 682,000 registered Uber riders. 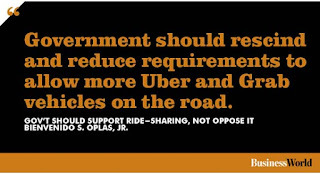 There is one important move that the LTFRB can do: rescind and reduce many of those multiple requirements to allow more Uber and Grab vehicles on the road, and make these fewer requirements be available to conventional taxis too. This may be done via administrative order. If this will require legislation, Congress should heed the clamor of the citizens and passengers for safer, more convenient rides. Government should learn to step back from too much bureaucratism and recognize the ingenuity and innovation of the sharing economy. Providing safe transportation to people who do not own cars or those who leave their cars at home is not a crime that should be slapped with multiple permits, fees and bureaucracies.